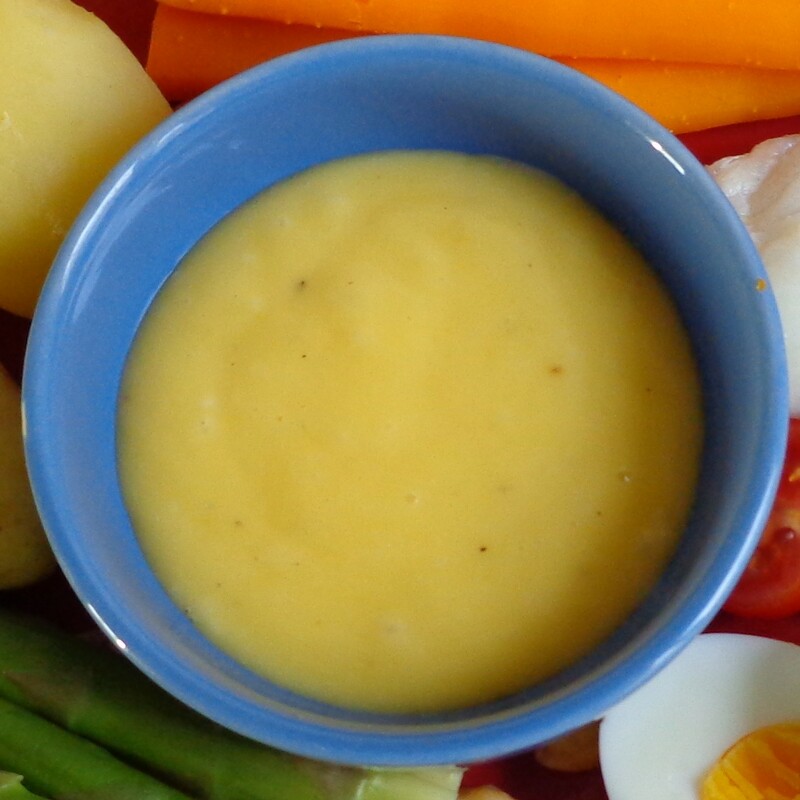 This traditional Provençal sauce is a garlic mayonnaise made with olive oil. It takes its name from the Latin words for garlic (allium) and oil (oleum), and is very close to the modern French word for garlic (ail, pronounced ‘I’). In southern France, you will often find aïoli on the table to accompany fish soup, seafood, potatoes and other vegetables. Sometimes it takes pride of place as the centerpiece of a dish called le Grand Aïoli, in which a bowl of sauce is surrounded by fish, vegetables and boiled eggs. At home I use aïoli quite regularly as a pungent sauce for everything from artichokes to roast chicken. It is quick to make and may be refrigerated and stored for up to a week. Place the yolks in a ceramic or glass bowl heavy enough to hold still while you stir. Add a few drops of lemon juice. Stir to blend thoroughly. Begin adding the olive oil drop by drop, stirring constantly. The easiest method I’ve found is to hold the oil bottle in my left hand with the tip resting on the edge of the bowl, and to stir with my right hand. Once the sauce starts to hold together, you may add the oil more quickly, but be careful not to overwhelm the sauce or it may separate. Now add the rest of the lemon juice and stir. Add the salt and pepper and stir again. Peel the garlic and put it through a press directly into the bowl. Or, if you have a mortar and pestle, you can use it to crush the garlic cloves as they do in Provence. Stir once more. If you’d like a stiffer sauce, add 2-4 tablespoons more oil. This recipe makes about 1 cup of aïoli. If you don’t need it all right away, place what’s left in a clean jar, cover tightly and refrigerate.